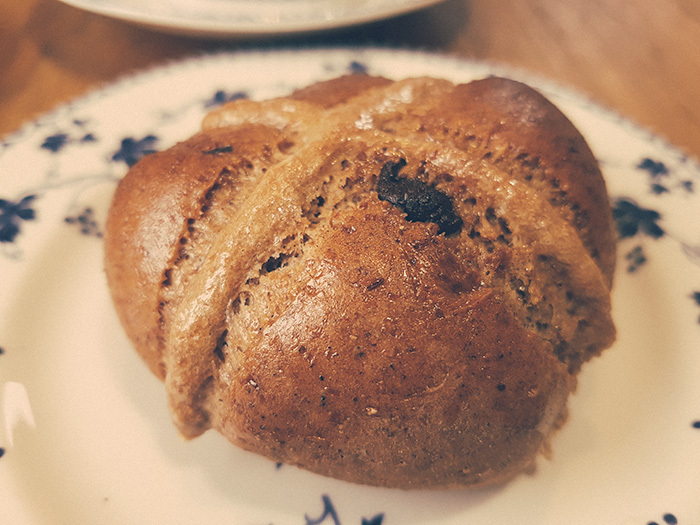 A delicious wholewheat hot cross bun with dark chocolate chips with just 1/2 teaspoon of fructose-free sweetener per bun! 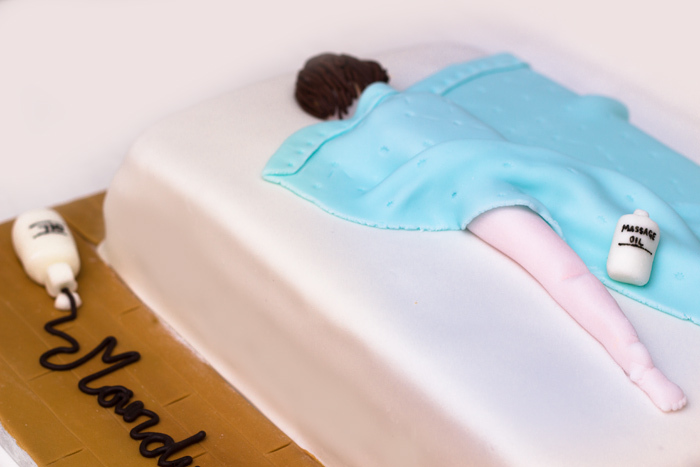 Today is my husbands birthday. 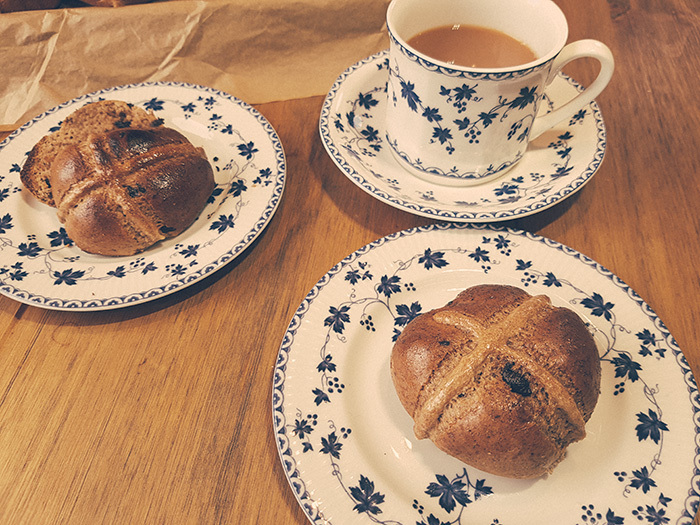 So instead of having a weekend lie-in, I got up at 6.30am to make him a freshly baked breakfast of chocolate chip hot cross buns. 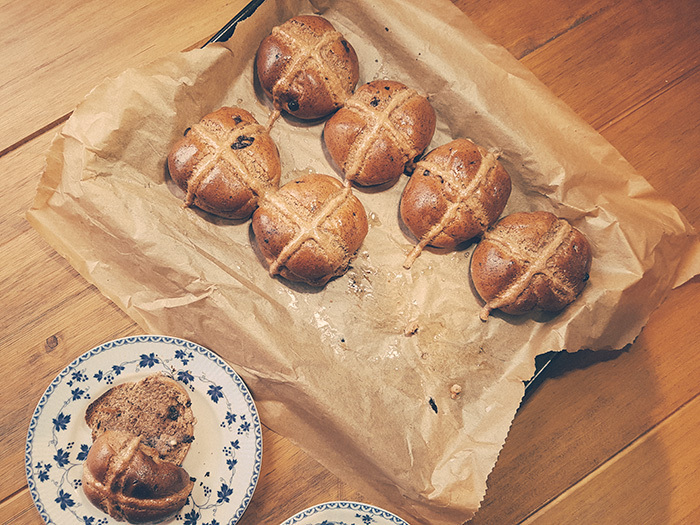 As I didn’t have time to bake yesterday and we had guests I bought some Tesco Finest Toffee Fudge and Belgium chocolate hot cross buns….I have just checked and these had over 3 teaspoons of sugar per bun and their regular ones have over 4 teaspoons of sugar per bun! These little gems have 1/2 teaspoon of fructose-free sweetener per bun so I can feel a little better about indulging in these for breakfast! This recipe has been adapted from a Sarah Wilson recipe. 1/2 tablespoon dried instant yeast. 1/2 teaspoon rice malt syrup. 150ml full-fat milk, lukewarm (not hot, otherwise it will kill the yeast). 30 g butter, at room temperature. 25 g 85-90% dark chocolate, chopped finely. Mix together the yeast, 1 tablespoon of spelt flour, rice malt syrup and the warm milk. Cover the bowl and leave to stand in a warm place for around 15 minutes. In a large mixing bowl combine the flour, salt, stevia and spices. Mix well. Add the butter to the flour mixture and rub it in with your hands until combined. Once the yeast mixture is frothy and this to the flour mix and the whisked egg and stir well. Add in the chocolate pieces and fold in. Cover the bowl again and leave to stand in a warm place for 40 minutes – the dough should have almost doubled. Preheat oven to 200°C/400°F/Gas Mark 6 and add some parchment paper to your tin. Knead your dough on a floured surface. The dough needs to be smooth and elastic. Cut your dough into 8 equal pieces and read each one into a round shape. 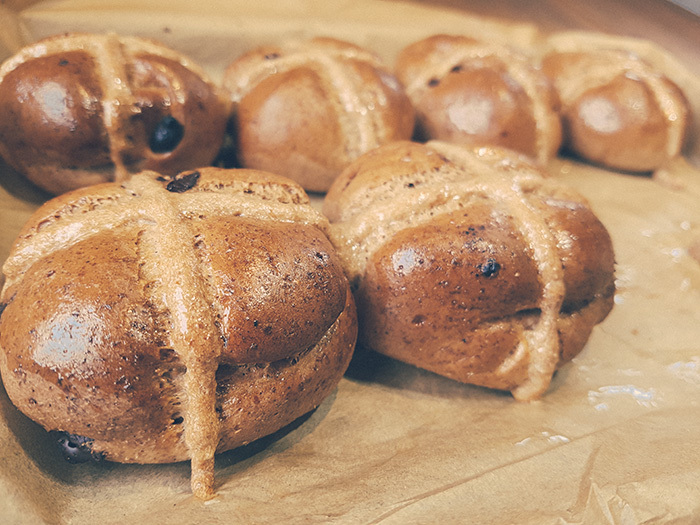 Place the buns on your baking tray in to 2 rows – don’t worry if they don’t touch as they will expand while baking. Cover them again and leave to stand in a warm place for 15 minutes. 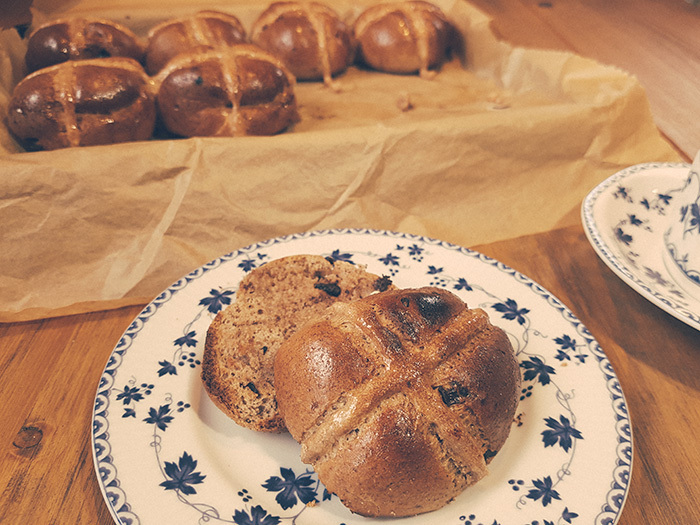 While your buns are expanding in the warmth mix up your ‘cross’ mixture. Mix together 35g spelt flour and 60ml water to form a paste (if it’s too runny just add more flour). Fill this into a piping bag (or a small ziplock bag with a corner cut off) and pipe your crosses over the buns. Place the buns in the oven for 20 minutes. Mix together the syrup and water. Once the buns have cooked, remove them from the oven and immediately brush with this glaze. 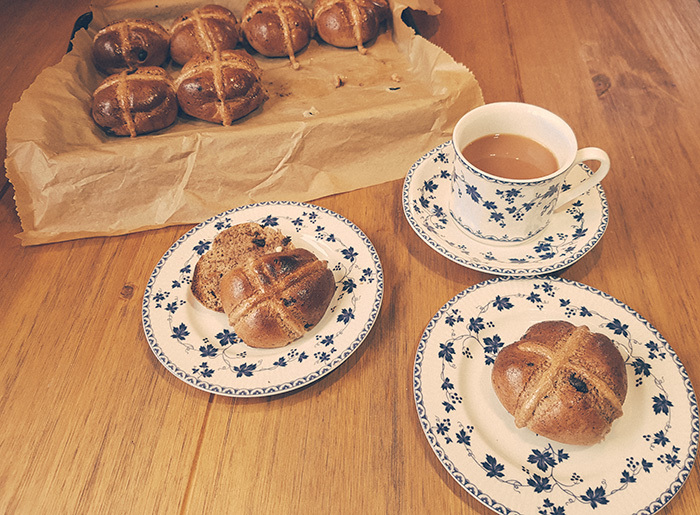 And there you have it….serve these warm with a generous lump of butter! My opinion on these? They were quite dry so definitely needed the butter, and I would personally add more spice to them next time. However, they were a lovely treat and went down well. 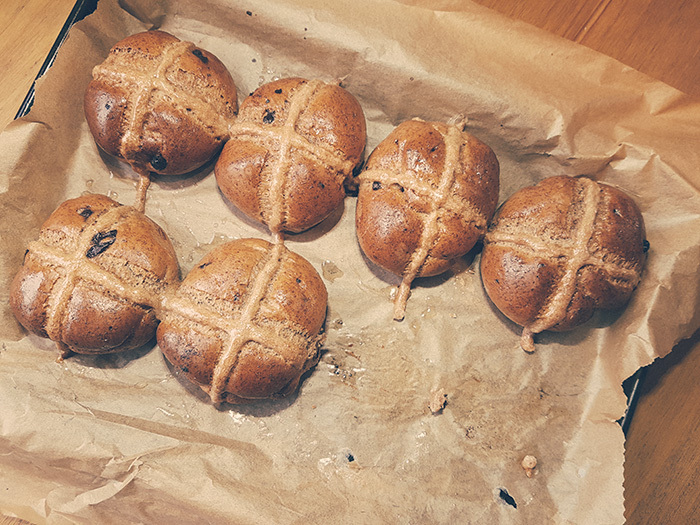 Kieron topped them with honey and went back for thirds so I think that meant he liked them too! Happy Easter everyone! I hope you get to eat lots of chocolate this long weekend!